Pauanui Glade Holiday Park has direct access to the Pauanui/Tairua tidal estuary. Boat trips, fishing and swimming are a few great possibilities to actively spend your time while on holiday at The Glade. 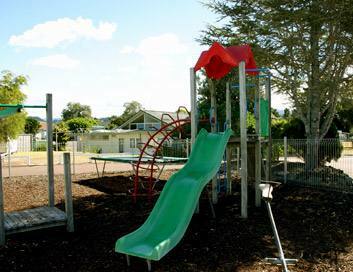 For children under 12 years, there is a playground at Pauanui Glade Holiday Park with a slide, a sea saw and of course, a trampoline. There is a mini putt close by just a short 5 minute walking distance, along with a skate board park nearby. Local people and businesses organise activities in Pauanui all year through. If you would like to participate in anything organised in town, just ask your hosts Greg & Steph. They know the locals well and will be happy to put you in contact with the right people.